The NEW Trampoline Bounceboard® is constructed with closed cell foam which is strong and flexible with great shock absorption. The only trampoline board that won't rip the surface of your trampoline and best of all, the board is light-weight and buoyant. Body surfers in Hawaii use a similar foam to ride the waves because it stands up against slamming on the ocean floor. Designed for ages 8-Adult. The softer choice to practice snowboarding and wake boarding tricks. This is one case where a warped board is a good thing. 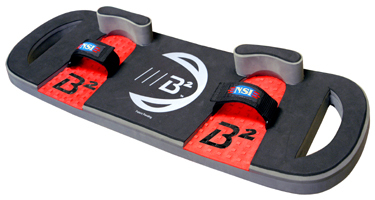 The Bounceboard® flexes with the trampoline but will return to it's original shape. This is an exciting new sport accessory for your trampoline. Catch air. Get warped.